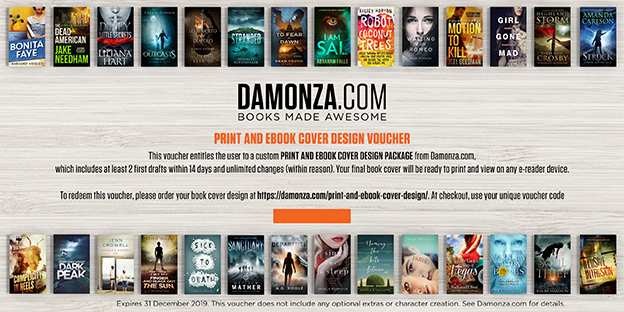 The ideal gift for any author, Damonza.com now offers a voucher that can be redeemed for a print and ebook cover design, our most popular package, worth $595. Simply complete the order form with your details, submit payment, and we will send the printable voucher to you within 24 hours. This is an amazing gift for the writer in your life and is redeemable for 12 months. All the usual Damonza.com guarantees apply and no notice period is required to use the voucher. As soon as it is used, we will supply at least two drafts within 14 days, and provide unlimited changes to the author (within reason). A minimum of 2 paperback cover design drafts, based on your specifications provided by the author. We begin with the front cover, and work our design from there. Unlimited changes (within reason) to one of those book cover drafts until the author is 100% happy, or we’ll design new drafts!